Heating caused by gradient coils is a considerable concern in the operation of MRI scanners. Hot spots can occur in regions where the gradient coil windings are closely spaced. 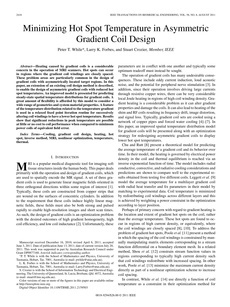 These problem areas are particularly common in the design of gradient coils with asymmetrically located target regions. In this paper, an extension of an existing coil design method is described, to enable the design of asymmetric gradient coils with reduced hot spot temperatures. An improved model is presented for predicting steady-state spatial temperature distributions for gradient coils. A great amount of flexibility is afforded by this model to consider a wide range of geometries and system material properties. A feature of the temperature distribution related to the temperature gradient is used in a relaxed fixed point iteration routine for successively altering coil windings to have a lower hot spot temperature. Results show that significant reductions in peak temperature are possible at little or no cost to coil performance when compared to minimum power coils of equivalent field error.